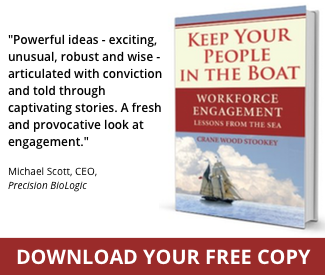 Engage the most clear and productive state of mind in your people? Consistently rouse the most clear and productive state of mind in yourself? This unique experiential training gives your organization’s leaders enhanced skills for finding the full depth of their personal leadership through repeatable practices of self-assessment and self-correction. Crane gives managers and executives tangible skills and simple, daily practices to strengthen their ability to see the ocean instead of just the waves. Stronger self-leadership by accessing the unencumbered state of mind when needed. Enhanced ability to lead people through the mental stresses of challenging times. Enhanced ability to support people’s best performance by helping them see past their “mental claustrophobia”. Main stage, breakout or series of 3 half-day or full-day trainings over 6 months. Are your leaders as skilled as they should be at being in control without being controlling? Do your leaders know how to bring out the best in those they lead by making full use of the power of “Less-Is-More” in their leadership? We all know that “command and control” is out. But command doesn’t deserve the bad rap it gets. The English word “command” has the same root as “mandate”, and at its root has the sense of entrusting duty to a worthy person. What’s needed today is command and trust – the right combination for leadership in challenging times. Stronger ability to use effective leadership instead of coercion. Enhanced skill at clear communication. Stronger ability to use the power of “Less-Is-More” leadership.